Educators have long sought to define quality in education. With the proliferation of distance education and online learning powered by the Internet, the tasks required to assess the quality of online programs become even more challenging. To assist educators and institutions in search of quality assurance methods to continuously improve their distance education programs, the Sloan Consortium (Sloan-C) published Elements of Quality: The Sloan-C Framework (Moore, 2002), outlining five pillars of quality – learning effectiveness, access, student satisfaction, faculty satisfaction, and cost effectiveness for online programs. Based on a relevant literature review, this article explores the reasons behind the push for online program quality assurance, key benchmarks recommended by major accreditation agencies and some best practices currently utilized to ensure online program quality standard. It serves as a starting point for distance education administrators and educators to formulate program goals and assessment policies regarding their online programs. Wang, Q. (2006). Quality Assurance – Best Practices for Assessing Online Programs. International Journal on E-Learning, 5 (2), 265-274. Waynesville, NC USA: Association for the Advancement of Computing in Education (AACE). Retrieved April 22, 2019 from https://www.learntechlib.org/primary/p/5601/. Alva, J. K. (1999). High education and its millennial predicament. The League for Innovation in the Community College Conference on Information Technology. Belfer, K. (2000). A learner centered assessment of quality for online education: Course climate. World Conference on Educational Multimedia, Hypermedia and Telecommunications 2000(1), 1265-1267. Carnevale, D. (2000). Shopping for an online course? Kick the tires and check the mileage. The Chronicle of Higher Education, February 2. Carnevale, D. (2001). Assessment takes center stage in online learning. The Chronicle of Higher Education, April 13. Corderoy, R. M., Stace, R., & Pennell, R. (2002). Quality assurance and online teaching and learning: First steps. 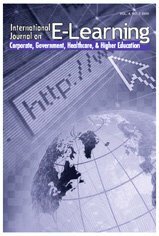 Proceedings of the International Conference on Computers in Education, 619-620. McKenzie, B., Mims, N., & Bennett, E. (2003). Successful online assessment, interaction and evaluation techniques. Society for Information Technology and Teacher Education International Conference 2003(1), 426-431. McLoughlin, C., & Visser, T. (2003). Global perspectives on quality in online higher education. World Conference on Educational Multimedia, Hypermedia and Telecommunications 2003(1), 253-256.